Nevada offers a little something for everyone. 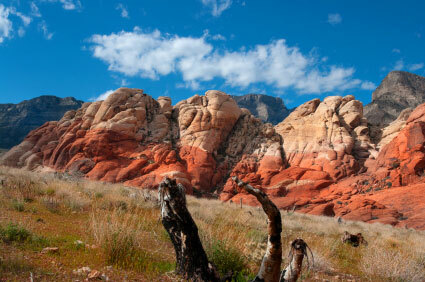 From majestic mountains to desert valleys, nature has endowed Nevada with diverse and unique ecosystems. In addition, it is home to the cultural phenomenon of Las Vegas and shares the Hoover Dam with Arizona. With eight state colleges and universities - including the Desert Research Institute, and several private schools, Nevada offers a vital environment for study and exploration of all kinds. As exciting as the prospect of college can be, potential students are often discouraged by the cost. However, when you consider that the average college graduate will earn more than a million dollars more than his counterpart with only a high school education, the costs seem more reasonable. Luckily, the state of Nevada offers its students a number of outlets for financial relief, including scholarships, grants and work/study programs. Unfortunately, many students will discover that these programs do not offer enough help to cover all college expenses. Once all other avenues are exhausted, it’s time to investigate loans. The state of Nevada formerly employed USA Funds as the state-sanctioned Federal Family Education Loan Program (FFELP) guarantor. In 2010, the FFELP was replaced by the Direct Loan Program (DLP). Since then, federal loans like the Stafford, Perkins and PLUS loans have been managed by the DLP. Stafford loans are the most common type used, while Perkins loans are reserved for those with greater financial need. Independent students are often awarded Perkins loans. PLUS loans are for parents of undergraduates, as well as graduate students to help supplement their funding, and require good credit. The benefit of the DLP is to allow students the ability to work directly with a single provider (the government) throughout the life of their loan, thereby removing the problems and extra costs of third party lenders. Fixed interest rates and easy and deferred repayment options are available through the DLP. USA Funds still offers a host of services and maintains a valuable set of resources for college-bound students and their families, including tools to help plan for college, and help applying for loans and scholarships. Financial literacy programs for college students, debt management and default prevention consultation and support are just some of the additional services offered. USA Funds has also provided more than $100 million in scholarships to low to moderate-income students and in grants to nonprofit organizations to improve student access to, and success in, higher education. Sallie Mae was one of the largest lenders involved with the FFLEP, and still offers a wide range of alternative loans, featuring the Smart Option student loan. If you are a Nevada resident and heading off to college, you might explore the range of student loans furnished by Sallie Mae . They specialize in providing innovative private loan solutions for college students, including non-traditional and non-degree seeking borrowers. You should make sure you’ve made full use of the DLP before accepting alternative loans. After your federal loans are all approved and disbursed, you may find that your Stafford Loan has fallen short of your actual college tuition. If you are like most of your peers you will seek out an alternative loan or supplemental loan. This is how many kids manage to load up on college debt, but at the same time the funds are a necessity. Alternative loans run the gamut from basic to those customized for continuing education students and those in community college programs. There is something for everyone, so shop carefully and understand all the details. Remember that alternative loans are handled by private companies rather than the federal government, and as such, are not subject to the same rules and regulations. Important differences to consider are interest rates and fees, as well as repayment plans, which, with some lenders, can begin as soon as the loan is disbursed. Make sure you understand what you are committing to before signing up for any loan. You must also realize that any time you apply for an alternative loan you come under the scrutiny of a credit check. If you don’t have enough credit or your credit is less than stellar, you can still apply for loans with a co-borrower. It’s the situation that over half of all undergraduates find themselves in, according to most statistics. Students often choose a parent, other relative or good friend to co-sign with them. The better the credit score of your co-borrower the better your chances for a good interest rate. When your multiple student loans come due and your attempts to make your monthly payments seem futile, you have a couple of options. Whatever you do, do not default on your loans. At the very least call your loan provider and consult with an account manager. You may be able to turn your loans into a consolidation loan. Consolidating gives you one low monthly payment with extended payments. When you actually pay on time, consistently, you may be eligible for interest rate reductions, depending on the loan. And some loan products make allowances for releasing a co-borrower from the loan at this point.